Our neighbor and his whole family is in Missouri on a vacation. When they learned that snow is on the weather forecast for Friday they immediately called us asking a favor is we can clear their driveway from snow while they are away. They do not have to call actually, my husband always do it for them. While we were on the phone, they cannot stop talking how beautiful Branson Landing, Missouri is. They are staying at the new Hilton Promenade at Branson Landing, right at the center of town across the Hilton Branson Convention Center Hotel. With the New Year’s Eve Package that they got from Hilton, they will be welcoming the New Year at the hotel with stylish dinner and party to welcome 2009. Other than the New Year’s Package, you can choose from several theme packages from Hilton like The Thanksgiving Package, It’s a Wonderful Life Package or Santa’s coming to Town Package. We have not been to Branson Landing but I am sure this will be in our future plans. We would like to explore the beauty of Branson Landing where the famous water fountain is located, see the beauty of nature and other attractions the city has to offer. Of course, the best accommodation of the Hilton hotels will make your stay more memorable and unforgettable. I thought it will be a quiet new year's eve for us tomorrow. Like always, we stay at the house and wait for the ball to drop on TV. Never will I go to Times Square on New Year's eve. But tomorrow we got an invitation to my BIL's house. For sure we will be staying there until 2009 comes. I still have work but at least I am not cooking this time. How about you, how are you going to spend your last day of 2008? If we have to go to a party, I always give at least two hours to prepare myself. I spend a lot of time taking a bath because I still have to do the hair removal on my legs and eye brows. My husband has no patience waiting for me so he asked me if I want a permanent hair removal so that I do not have to do all these every time we have to go somewhere. I have a gift certificate from the salon; maybe I can use that for a laser hair removal, right? This could be a nice treat for me for the New Year. There is something that i did other then inserting the izea rank code verification that made the font bigger. I can not adjust it to how it was before. I do not know anything about templates, etc. I tried to undo the changes I made but it's still the same. So now, when I write a post I make sure I chose the smaller font not the normal anymore. Got tired of it, maybe it's time for a new template/design. But where is the time, right? As long as you can still read my blog, I'm fine. Christmas is the time of celebration and being together with the family. We get ourselves busy by buying our presents to our loved and preparing our homes for parties. Some are very lucky to be with their families and loved one these holiday seasons but there are others who cannot be with their families for a very special reason. I am referring to families of our military heroes who cannot be with their husbands, wives, brothers or sisters. They are doing the unselfish sacrifices for all of us to bring peace and security to our country. As a way of thanking our military service members, veterans and their families, you can make a donation through Sears Heroes at Home Registry. Any amount that you can give can fulfill a wish of one of our military families whose family member cannot be with them this Christmas. This will be our way of giving thanks for the sacrifices they make. Your donations are not tax deductible which will be given as Sears gift cards to registered families. Topping on the wish list at sears.com are kids shoes, boys and girls pajamas, coats and dresses. They can all buy these through the Sears gift cards they will be getting. One best way of giving this Christmas is to be able to give love and fulfilling somebody’s little wish. I am back after being off from blogging for the past 24 hours. I was at work yesterday until 3pm then have to stop by the mall for some last minute gifts. It was not crowded at all but not the supermarket we passed by. When we got home, I continued cooking then prepare the house for our Christmas dinner. No chance to open my computer at all. We had a good time. Slept early morning. Woke up late today and watch DVD's while atthe computer at the same time. Wishing you a wonderful christmas and the best of the holidays! One of the cutest Christmas cards I got today is from my friend in San Francisco. She made a card with her picture on it and she is expecting!!! I am so happy for her. It took them almost five years to have a baby. They have been to several fertility clinics trying their chance to have a baby but it never happened. I believe that everything happens for a reason and at the right time. After I got her called I called my husband right away telling him about the good news. He told me we should give my friend something to treasure being a first time mother soon. I told him about U Cord, the Cryo Cell’s stem cord blood preservation service. Through Cryo Cord Blood Bank, one is able to preserve their newborn’s umbilical cord stem cells that can easily be extracted without risk or pain to the mother or newborn baby. You will be receiving a Cryo-Cell Collection Kit complete with all the instructions for you and your doctor. By preserving your child’s cord blood stem cells, you are preparing for what could happen in the future. It treats more than 70 diseases such as anemia, numerous types of malignancies, deficiencies of the immune system and a lot more. If you are also interested in gifting yourself or a loved one a gift of stem cell preservation, you can request more information at cryo-cell.com/gift. It was a pleasant surprise to still get a bonus from our boss today. Everybody was not expecting it anymore but luckily our company is not directly affected by the bad economy. We are still able to make our numbers. Thanks for remaining a generous boss. You know now where I am heading after work, right? SHOPPING! This Route 66 printed hoodie is my gift to my friend’s 8 year old daughter. 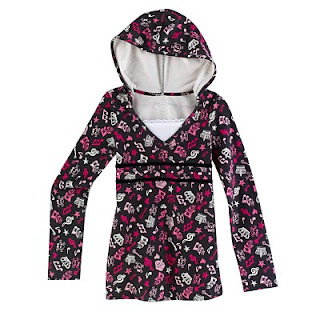 She would definitely like this hoodie that can go with the jeans that her mom has bought her. I am giving this just kidz deluxe doll set to my daughter. I still have her big stroller inside my car but my daughter would rather push it around than riding on it. 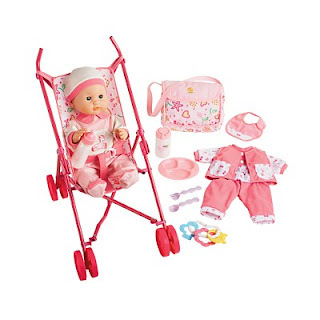 With this little stroller and a doll, she can push it around while strolling at the park or even at the mall when we go shopping. So if you are not done shopping, get your last minute gifts from Kmart. They have lots of valuable gifts at the store and online that you can shop without breaking your budget. Because it is below freezing (12 degrees), the snow turned into ice. This is the most dangerous thing. Even is you are driving a 4x4, if the road is icy, the car can still slide. Some of the ice are black that you can not see on the ground and this is what they call "black ice." Warning!! !Do not step on it! Better walk on the hard white snow but not the shiny black ice. I had my baptism of fire on my first winter in the East Coast. I just fell on the parking lot - twice!. Be careful and always wear your snow boots that has a good traction. However short or long a weekend is it is the quality time that we spend with one another that counts. Hubby’s weekend starts on Friday night while mine starts on Saturday noon. As soon as I get home from work, we do our errands and food shopping. We always tire ourselves doing this but before we go home, we always make it a point to rent a new movie. I always look forward for our Saturday movie nights because it is the time that we relax ourselves by just watching a movie at home. We never go to a theater anymore. We want to spend more of our time with our daughter who also loves watching movies. She gets excited with it. Once she sees me take out a bag of popcorn, she wants to help mommy does the popcorn popping in the microwave. All Roads Lead Home The Movie is a wholesome movie for the family. This will be on our top list for our Saturday night movies. Watching a family movie with full of message is best when you are with your family. The intense of the movie is more felt when you are together. I encourage everyone to watch the trailer and make this movie a part of your family movie night tradition. Do You Want to Buy a Used Tissue? It's Scarlett Johansson used tissue. Change mind? If you are interested you can bid it on ebay. I heard it is more the $3,000 last night. Well, if you are interested, you can still bid up to tomorrow. It is authentic tissue with Scarlet's signature on it sealed in a zip lock. I went to work this morning despite the snow forecast. I cannot afford to miss work if I am not sure that I get paid. Every penny counts if you are having a very tight budget. It was not busy at work so we got the chance to discuss what is going with our economy. One employee said that he is almost at the edge; he might think of filing bankruptcy if he cannot recover from financial problems. He is living with debts after debts to survive. Although he has a second job, it is not sufficient because they have cut his hours. One employee mentioned to him to try Net Debt and learn about debt settlement. It is hard to handle all these financial problems yourself which sometimes will bring you to incorrect solutions. He was asked to read Net Debt’s debt consolidation FAQ to get himself familiar on how it can help him. Net Debt is an online help to your debt problems. You can talk to them about your financial problems if you desire to live debt free in the future. There will be no embarrassing questions to be asked, the entire process starts by registering online and filling out the quick and easy questionnaire available. But if you wish to talk to their friendly account specialists, they are always ready to help you. In the event of a delayed opening or school closing due to inclement weather, we will get a phone call from the Global Connect System. The school also gave us a website to check further information about school closing or any emergencies. The morning news also flashes the school closing and delays on TV. How can your child miss all of this right? Like today, the schools are closed because of the coming snow storm; we got calls on hubby and my cell phone plus the house phone. They will call the entire phone numbers listed on their information sheet. This system is really helpful and they call in advance (the night before or very early in the morning) so that you do not have to wake up your kids anymore. I hope Philippines especially Manila will have this system too rather than letting kids go to school then later announces school closing when everybody is already stuck in school then have difficult time commuting back home. I took this picture outside the office on my way to the parking lot. It was around 6pm. Snow is in the forecast for tonight and it has started falling. 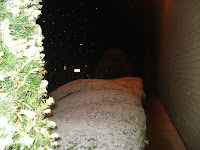 Right now around 9:30 p.m., we already have around an inch on the ground. Papa has started to clean the walkway and put some salt on it. I wonder how's the morning commute tomorrow? At work, we are no longer allowed to answer our cell phones. Some people have abused the cell phone policy so now it is totally ban from the office. The constant ringing distracts people from working so my boss modified the policy again. I do not normally use my cell phone at work although I leave it on the whole day. If somebody has called me or has left me a voicemail, I will make a return the call using our office phone. Lately, I have been getting missed calls from unknown numbers which are not on my phone book. I do not mind that as long as he or she leaves me a voicemail so that I know who you are. Thanks for caller id; I was able to track a long lost friend from high school. She said she is not used to leaving a voicemail so she just hangs up when I did not pick up the phone. I used the best reverse phone lookup service available online to know who the caller was. The phone number is listed to a foreign sounding last name but the first name sounds familiar. I called the number back and it was my best friend from high school using her married name. I was so delighted speaking to her again and we might see one another this spring. On December 18, Manny is turning 30 years old. He will be celebrating his birthday at his hometown General Santos City on Wednesday (Phil Time). I have read at inquirer.net that GMA is attending plus three world class boxers from Mexico and Venezuela. There are two venues for his birthday. One at the KCC Convention Center where some 300 VIPs and showbiz stars will be attending and for his fans and supporters, it will be at the Oval Plaza Grandstand in General Santos. A Las Vegas ambiance will be created for the party with a boxing ring as the stage surrounded by slot machines and poker tables. Pacquiao has a budget of P1-M for his birthday which includes 25 lechons, 5 roasted cows and around 6000 pack meals for his fans at the Oval Plaza. This will be a party that Mindanao especially GenSan will not ever forget. Happy 30th birthday to you Manny! I always believe that the best thing I could give to my child is education. Even if we do not have the much money before, my parents did their very best to send me to school that they can afford to finish my education. Now that I am a mother I want to instill to my kids the same principle that my parents have taught me. Education is the only thing that nobody can take away from you and it will be with you wherever you go. I have a stepdaughter at home who is in high school. Sometimes she becomes lax with her studies which have somehow affected her grades. She will be in college soon so her father and I had a heart to heart talk with her and asked if she wants to sign up for a free tutorial classes at Brightstorm. We showed her the professionalism of the website. At Brightstorm, each course is designed by a classroom teacher which will be in a form of video lessons. Each student can do the course at her own pace and order. We are happy with the result. She has improved with her grades. It has given her educational effectiveness that every parent is happy to be achieved. If you want to experience what brightstorm can bring, Sign up for a free brightstorm acocunt to get an access to a free course. A year ago Joshua Persky was laid off from his job in an investment bank. He thought of a very unique way of advertising himself to companies or headhunters to be able to get a job. He made himself a sandwich board as a form of advertising saying, “MIT grad for hire” with his telephone number while at the same time handing his resume to passersby on Park Avenue, New York. It did not take long until he got a job. A company hired him last week and now he is a senior manager of an accounting firm in New york. More of his story here. 10:04 AM 1 Comments education, U.K. I came to the office very early today because my boss will be out of the country for a few days and he has left me a lot of assignments before he flew to the U.K. He is accompanying his daughter to find some student houses in Leeds who will be staying there for a year as an exchange student. They have looked at some properties at pickardproperties.co.uk already but my boss wants to check the place himself before the daughter starts moving in. He will be back before the 15th for our Christmas party. It is warm today. Yesterday it was in the 40's and cold, today warm then tomorrow only up to 39 degrees high -very cold! This is the reason why a lot of people gets sick! We always give a little something to our customers during the holiday season. For the past three years, we have ordered jackets and t-shirts with the company’s logo printed at the back. This year, my manager has thought of something different. Since we are all getting high tech with almost everything and electronic gadgets are on the top of the list, she asked me to find some cool personalized holiday gifts. I told her to take a look at four great holiday gift ideas being offered at pexagontech.com. They have personalized 16GB thumb drives with free custom laser engraving available in 15 different colors. If you want a more formal flash drive, get their business card flash drives with a hidden small USB cable at the back. Included is a free three line personalized text for a price of $15.99 after discount. For those who are eco-friendly, here is a cool one for you. They have a wooden USB flash drive with cap starting at $15.99 after discount. If you still prefer the classic holiday gift, pexagontech.com makes personalized pens in three unique styles and multiple colors. There is no minimum order and you can get these pens for only $1.59 after discount. Right now, we are completing our orders so that we get everything before Christmas. My manager is happy of the good deals we got from Pexagon. Smoking is not allowed at the White House but Obama said he will not do any violations once he starts living at the WH. Hope he will set a good example to the American people and the world.